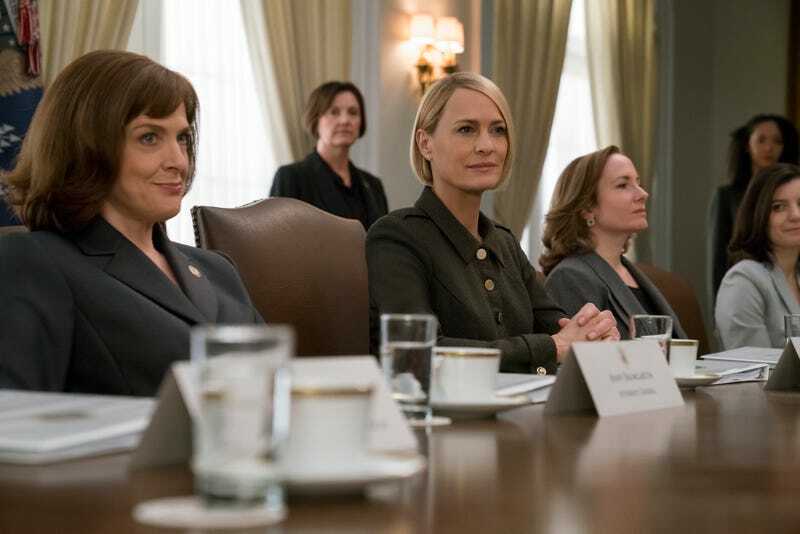 Claire’s choice of movie viewing a few episodes ago and the Gothic horror overtones to the soundtrack music of late have prepared for this moment: the spawn of Satan—or of Frank and Claire Underwood, close enough—is being loosed upon this world to bring about the end times. Contrary to my prediction in the previous review, said spawn is not Duncan Shepherd (more on that later), but a new life growing within Claire’s womb. (For how long now? What is the timeframe here and is it even remotely possible she and Frank had relations recently enough to make this happen?) On hearing the news, Doug Stamper is properly horrified. If what Claire says is true (always a very big “if”), Stamper has no claim on Frank’s estate whether the handwritten will turns up or not. There’s still the matter of that last item Frank gave him, however, a mystery Doug solves when Claire excuses herself from the Oval Office to vomit. (A pang of conscience over a trio of murders she recently orchestrated? No, now we know it’s merely morning sickness.) Stamper finds his initials carved under one of the drawer bottoms and grabs a mini-SD card that’s taped there. The final nail in the coffin for President Claire Hale (as she’s back to calling herself now)? Ah, but a lot of people have thought that, and by the end of this hour, a few more of them are dead. Let us now pay our last respects to dogged (and dog-loving) investigative reporter Tom Hammerschmidt, who finally gets the confession he wants from Stamper. Doug doesn’t directly implicate Frank in the murders of Zoe Barnes, Peter Russo, and Leann Harvey, but the message is clear enough. Hammerschmidt then gets the dirt on Claire, but before he can reveal all, he is killed in what is staged to be a random stickup. He learned at least one trick from Frank Underwood, however, as he attaches something to his dog’s collar that probably contains another digital treasure trove of evidence against the current president. Pour one out for Cathy Durant, killed here for the third and presumably final time. With Petrov’s help, Claire is able to track her location (where Jane had stashed her away rather than carry out Claire’s dirty work) in the French Alps, and a sniper with a high-powered rifle takes her out. For his disloyalty, Jane is also snuffed, though I’m less clear on how that one happened. There’s a striking shot, almost science fiction-looking, of Jane in some sort of light-bed, complaining of a terrible migraine, so for now I’m going to assume poison. These three murders are orchestrated in time-honored Godfather fashion, as Claire consolidates her power to a degree Frank never dreamed possible. The cabinet is hers, Mark Usher is on the ropes as the Russia investigation closes in, and Bill Shepherd inches closer to death’s door with no help from Claire required. With Stamper delivering the evidence that the Shepherds knew about the danger posed by the refinery and used the disaster to install their apps, it’s almost too easy for Claire to topple her enemies, considering where we were just a few episodes ago. Part of that is due the accelerated pace of an eight-episode season, but for the most part, “almost too easy” has been encoded in the House Of Cards DNA from the start. If anyone is going to take her down now, it will probably have to be Stamper—but now that the proposed Michael Kelly spinoff has been scrapped, that’s no sure thing. Only two episodes remain. The opening minutes of “Chapter 71" provide a little more context for Claire’s cabinet takeover last week. Some of the dismissed cabinet members are implicated in the phony Russian plot along with Usher, so at least there’s some pretext for Claire’s maneuver, flimsy though it may be. Regarding Duncan’s parentage: It doesn’t make much sense that the big revelation is that he’s actually the housekeeper’s son by an unknown father, raised by Annette. Why would we possible care when this character has only been around for six episodes? “Tell him who he is,” Annette implores Bill, who won’t do it. For now I’ll stick with my prediction, even though it’s looking more like misdirection given Claire’s revelation at the end of this episode. My latest out-of-left-field prediction: Claire dies during childbirth. Frank has his revenge through his heir. Is any character less respected on this show than Seth Grayson? Watch, he’ll be the lone survivor.